Well thankfully today I felt much brighter when at last I woke up (late night, late rise) bathed in sunshine on the bed. I stretched luxuriously and smiled, the first time freely and without effort for quite some time. The Champix has had a lot to answer for, including a hangover from a couple of months of feeling emotionally deadened, which is manifesting as feeling overwhelmingly swamped by my emotions. I’m glad to be feeling again, but I shall be glad when it’s evened out and I feel balanced and calm again. So I rose, socialised with my visitor guest for the day, Mark (Lelani’s brother). He is a real gentle giant and despite being considerably younger than I, really pleasant, low maintenance company! 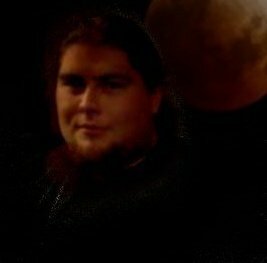 I made this icon for his Facebook awhile ago and enjoyed making it all dark and moody with the moon. When Lina came home from school, the three of us walked into town together in the frigid, fading sunlight through the park, where I took a couple of photos. 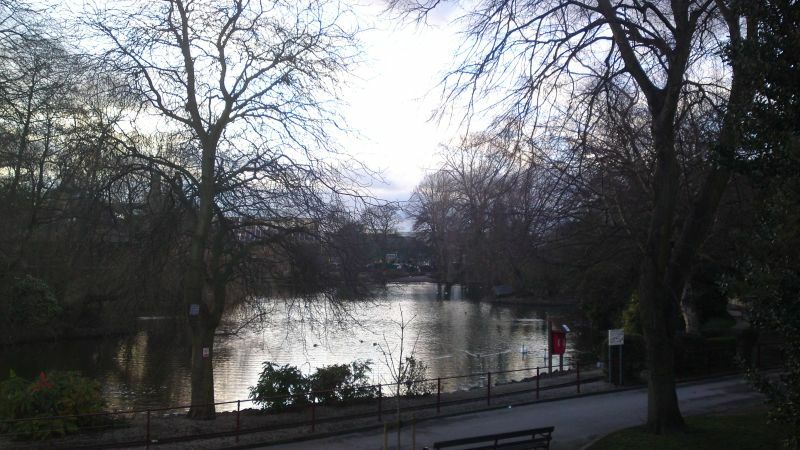 This one is the view across the lake from the footbridge into town, the one I showed a photo of the other week. 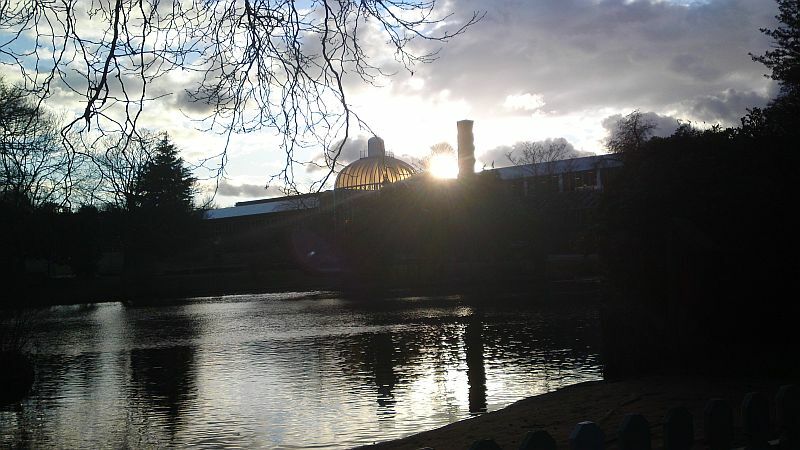 This one is the back of Queen’s Park Leisure Centre as the sun goes down, the park lake in the foreground. We were there to find a new school bag for Lina, since we’d failed on that mission yesterday. Funnily enough we failed again today, so we still have to try again tomorrow! However, here are a couple of pictures from our bag hunting trip yesterday, when I also had my smashing grandson Connor with us (my stepdaughter Liane’s son). This one show’s Lina bemused in Marks & Spencer, made of bagfail. Connor’s trying to coerce her into choosing one! This one shows a somewhat happier Connor, rewarded for his saintly patience with that king of bribery food, MacDonalds! Finally this one is from today, you can tell the Valentine’s Day merchandise is on prominent display; Lina was somewhat taken by this giant rose, almost as big as her! Then later this evening I made everyone dinner; a scrummy chicken in honey, mustard & white wine sauce with fluffy roast potatoes and green beans in a little butter and slivered almonds. Made of win, it seemed to go down well with all. Wish I’d taken a photo! Tonight’s been a quiet one in readiness for the weekend. Tomorrow is Imbolc so we’ll be enjoying the company of friends and family around a fireside with good food and laughter. Then on Sunday it’s ‘the boy’ Aimee’s birthday, not just *any* birthday but her 30th! As her special treat we’re taking her to London to see The Lion King at the Lyceum Theatre and we’ll be back home on Monday. Here’s my wonderful and handsome dufus… I mean dog ~grin~ Bear, the German Shepherd. Isn’t he just beautiful? 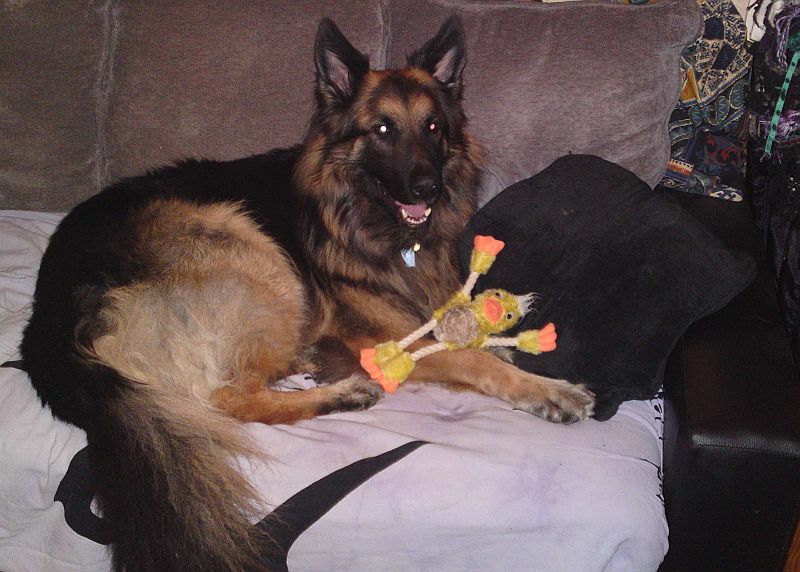 Note his claim to both the study sofa and his latest squeaky ropey toy! Oh and one wicked piece of news from Thursday evening, I had a big important assessment on my college course and passed with flying colours, yay me! So I thought I’d stop in the car park and take a photo to share with you here. 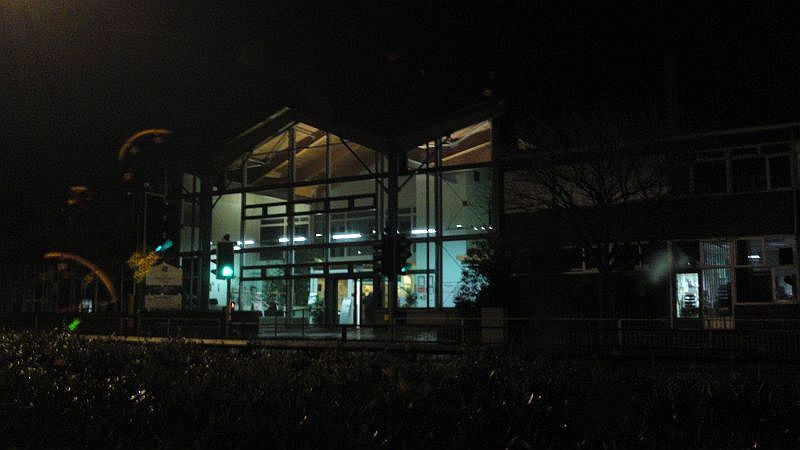 This is North Nottinghamshire College (in Worksop), my Thursday evening haunt for the classes I take to qualify as a psychotherapist. In April I have a 1 week, full time, residential course for Cognitive Behavioural Hypnotherapy. This is one of 3 weeks (the other two of which I shall be taking in September) which will amount to a fully accredited Diploma. It equates to approximately 21 days of study and training, equivalent to a one year part time course. Fascinating non? I’m also waiting for information to sign up for an N.L.P. course. In case that isn’t enough, I’m looking into finishing my degree next year; I’ve only one year left on that too. Busy busy busy… changing career direction utterly in your 40s is certainly challenging, but pretty thrilling too, to finally be working towards doing the things I’ve always wanted to do. 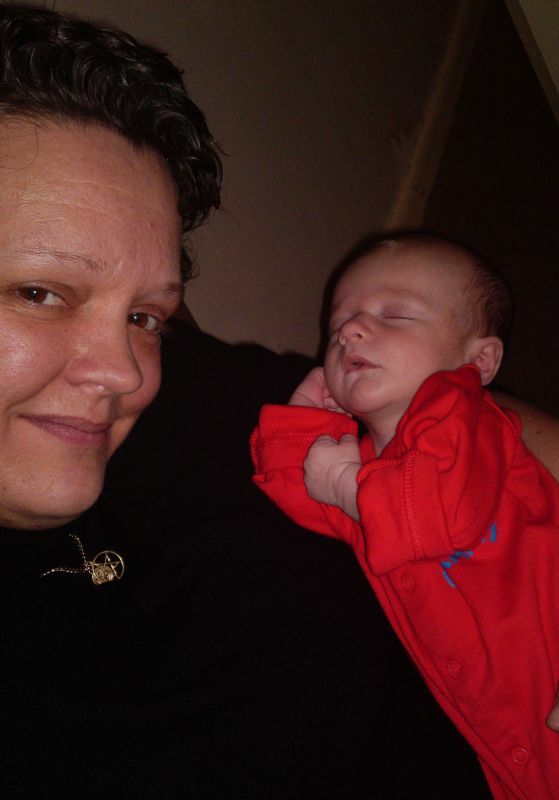 Last but most definitely not least, here’s an updated picture of me with Abi and Jono’s baby Declan (born in December). Isn’t he adorable? Lina and I visited the other evening, taking Mandy (Abi, Liane and Katie’s mum) with us. Because Liane and Katie are my stepdaughters and Abi is their sister, I’m considered a step-grandparent too, it’s great! It was lovely to catch up, the new parents are doing really well. Gosh that was a long post with lots to talk about. I only meant to do a quick catch up!